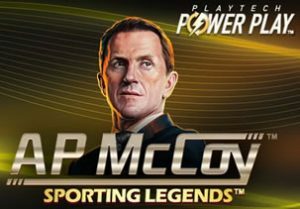 Another slot game in Playtech’s Sporting Legends jackpot series is based on the 20-time champion jockey AP McCoy. Played using a 5 reel, 243 ways to win game engine, AP McCoy: Sporting Legends comes with plenty of extras. Trigger the bonus wheel to win free spins with multipliers that can reach up to 7x or instant cash prizes of up to 1,000 times your stake. Activate Power Play for accumulated wins and even more extras. Play on all devices from between 25p and £1,250 per spin. The design in AP McCoy: Sporting Legends is pretty basic. There’s no race track, horses or fences in the background. There is a hint of the racing theme on the reels though. Joining the lower value A to 10 royals are a gold trophy, a helmet and a badge, each of which pay 1, 4 or 25 times your stake if you land 3, 4 or 5 on adjacent reels. AP riding a horse comes next, paying up to 80 times your stake per payline. The best symbol is the portrait of the great jockey. Land 3, 4 or 5 of them on a payline and you’ll receive a payout of 4, 10 or 100 times your stake. There’s also a wild. You’ll then go on and play your accumulated free spins, complete with the wild and win multipliers which can both boost payouts by up to 7x – in the Winning Line Free Games feature. More importantly, a win with more than 1 wild symbol will see the multipliers multiplied – this wins potential multipliers up to 49x. You can also have a crack at spinning with the Playtech Power Play feature. This is a series of 5 linked spins where the wins are accumulated. For example, if you won £3 on spin 1 and £2 on spin 4 then £5 would be added on top of anything you win on spin 5. Extra wilds and a super spin are thrown into the mix if you opt for the even more expansive Accumulator Plus Power Play. AP McCoy: Sporting Legends also offers a shot at landing a progressive jackpot prize. There are daily, weekly and monthly jackpots on offer. These can trigger at random on any spin. This isn’t the best-looking slot game you’ll see. The visuals don’t really seem to match the racing theme. If you can see beyond the design, then there are some decent extras on offer here. If you manage to get multiple spins of the bonus wheel from a single trigger you can expect some good results thanks to the multipliers and cash prizes. We’re still waiting for the great horse racing slot game - AP McCoy: Sporting Legends isn’t it but it can still deliver some decent thrills for fans of the sport of kings. I would also suggest you try Frankie Dettori: Sporting Legends (by Playtech) which has a similar theme.